The Queen's Bench (French: Cour du banc de la Reine; or, during the reign of a male monarch, the King's Bench, Cour du banc du Roi) is the superior court in a number of jurisdictions within some of the Commonwealth realms. The original King's Bench, founded in 1215 in England, was one of the ancient courts of the land and is now a division of the High Court of Justice of England and Wales. There was formerly a Court of King's Bench created in the British colony of Quebec in 1764; it was also known as the supreme or superior court until 1775. It was then abolished and re-established in 1777, following the Quebec Act. Following the separation of Upper and Lower Canada in 1791, the single court was replaced by several courts of King's bench of each region of the two new provinces. In 1849, the districts were reunited once again. In England and Wales, the Court of King's Bench (or Court of Queen's Bench) was the name of two courts. Each was a senior court of common law, with civil and criminal jurisdiction, and a specific jurisdiction to restrain unlawful actions by public authorities. The English Court of Queen's Bench was abolished in 1875 by the Supreme Court of Judicature Act 1873. The Court's jurisdiction passed in each case to a new High Court of Justice and specifically to the Queen's Bench Division of that court. The Irish Court of Queen's Bench was abolished by the Supreme Court of Judicature (Ireland) Act 1877. The Queen's Bench jurisdiction is now vested in the Queen's Bench Division of the High Court in Northern Ireland. There is a Queen's Bench Division as a division of the High Court of England and Wales and of the High Court in Northern Ireland. In England and Wales, the Queen's Bench Division is part of the High Court of Justice. It was created by the Supreme Court of Judicature Act 1873. In 1880 the former Common Pleas and Exchequer Divisions were merged into the Queen's Bench Division. Since 1882 the High Court has sat in the Royal Courts of Justice in the Strand, London. In Northern Ireland the Queen's Bench Division is part of the High Court of Justice in Northern Ireland, first created by Section 40 of the Government of Ireland Act 1920. The Division has similar jurisdiction to its counterpart in England and Wales. It sits in the Royal Courts of Justice, Belfast. The Queen's Bench Division in England and Wales today consists of the Lord Chief Justice and fourteen puisne judges, exercising original jurisdiction and also appellate jurisdiction from the county courts and other inferior courts, in practice being exercised by a division of the Queen's Bench only. Other sub-divisions include the Commercial Court, the Admiralty Court and the Administrative Court. The abbreviation QB (or KB) in legal citation is used in the Law Reports to denote cases heard in the Queen's (or King's) Bench Division. There are masters in the Queen's Bench Division; unlike the masters in the Chancery Division, the Queen's Bench masters have original jurisdiction, and are not attached to any particular judge. They hear civil trials and have equal standing with Justices when doing so. The role of a Master in the High Court of Justice of England and Wales is concerned primarily with trial and case management of High Court civil claims in London excluding committals to prison, judicial review and criminal cases. They also hear applications, act as taxing masters and occasionally as referees to conduct inquiries, take accounts, and assess damages. There remains an appeal from the master to the Court of a Appeal or an Appeal Court Judge; however, the ability of a party to appeal to a divisional court in every case, and thence to the court of appeal, ceased after a multiplication of appeals in small interlocutory matters caused a scandal. The Court of Queen's Bench grew out of the King's Court, or Curia Regis, which, both in character and the essence of its jurisdiction, dates back to the reign of King Alfred. 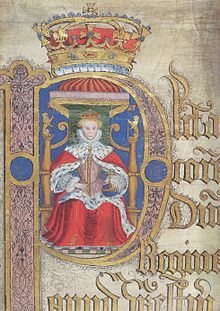 At first, it was not specifically a court of law, but was the centre of royal power and national administration in England, consisting of the King, together with his advisors, courtiers, and administrators. At an unknown point, another court, independent of the King's personal presence, grew out of the Curia Regis, and consisted of a number of royal judges who would hear cases themselves. It was recorded in the chronicle of Abbot Benedict of Peterborough that, in 1178, Henry II ordered that five judges of his household should remain in Curia Regis, referring only difficult cases to himself. The situation seemed, thereafter, to be that a central royal court, called The Bench, began to sit regularly at Westminster, leading, at some stage, to a separation between the hearing of matters relevant to the King and those that had no royal connection, which came to be known as common pleas. In 1215, the Magna Carta provided that there should be a court – the Common Bench (later Court of Common Pleas), which met in a fixed place – and, by 1234, two distinct series of plea rolls existed: de banco – those from the Common Bench – and coram rege (Latin for "in the presence of the King") – for those from the King's Bench. The King's Bench, being a theoretically movable court, was excluded from hearing common pleas, which included all praecipe actions for the recovery of property or debt, while actions of trespass and replevin were shared between the two benches. In practice pleas of the Crown were heard only in the King's Bench. The King's Bench was further divided into two parts: the Crown side, which had an unlimited criminal jurisdiction, both at first instance or as a court to which legal questions arising out of indictments in other courts could be referred; and the plea side, which dealt with actions of trespass, appeals of felony, and writs of error. The Lord Chief Justice of the King's Bench was also styled Lord Chief Justice of England, being the highest permanent judge of the Crown. The King's Bench became a fixed court sitting in Westminster Hall. Its justices travelled on circuit (a requirement of Magna Carta). 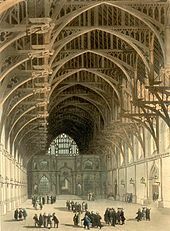 By a legal fiction, criminal cases to be heard in the shires were set down for trial in Westminster Hall "unless before" (nisi prius) the justice came to the county, which was where the trial actually took place. During the Commonwealth of England, from 1649 to 1660, the court was known as the Upper Bench. The court also gave its name to London's King's Bench Prison, in which many defendants were subsequently incarcerated, and to King's Bench Walk in the Inner Temple. ^ "Court(s) of King's/Queen's Bench". Profs.hst.ulaval.ca. 20 September 2012. Retrieved 21 January 2014. ^ "Abdule v UK state". bailii.org. Retrieved 15 June 2018. ^ "Queen's Bench Masters' status, jurisdiction and origins". bailii.org. Retrieved 15 June 2018. ^ 'House of Commons Journal Volume 6: 10 February 1649' Journal of the House of Commons: volume 6: 1648–1651 (1802), pp. 136–38. Accessed 26 April 2007.